← Nine minutes: a reasonable request? More than that from Ferryside? That was the downbeat opinion of an Arriva guard reported lately by Fishguard Trains regular DBJ. Are things really as bad as that? Without any facts and statistics to rely on, everything is going to be anecdotal for a while yet. But just to redress the reporting balance, here are three pictures from a recent Fishguard Trains return trip to Carmarthen. 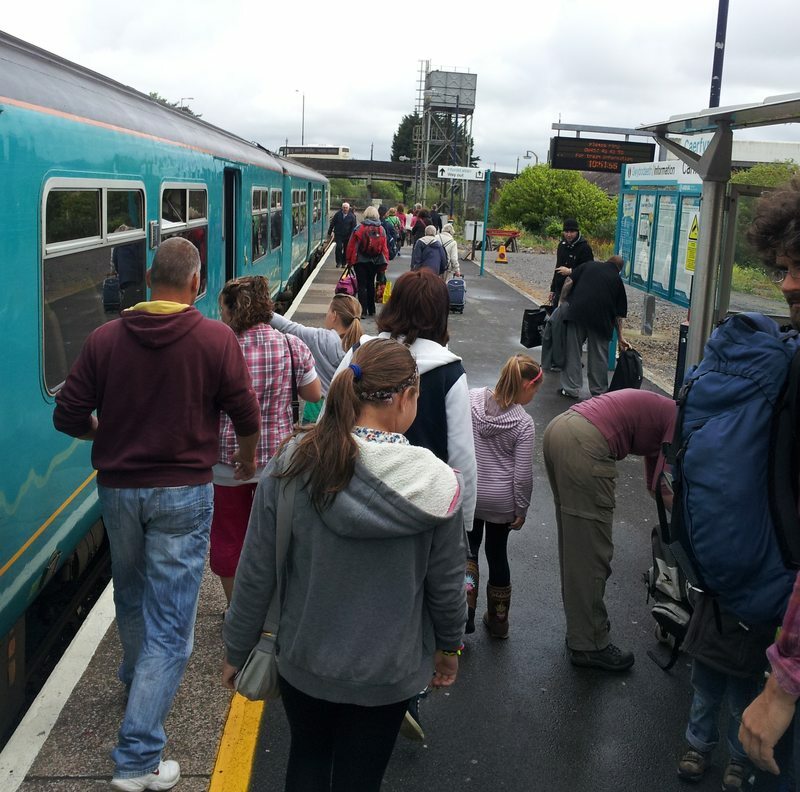 … by Carmarthen, something between 30 and 40 passengers leave the train.People of all ages, children, old people, families, locals, visitors. That looks pretty respectable to us. Returning on June 7th by the 18:46 arrival into Fishguard and Goodwick, the scene if anything is even more encouraging. About a dozen people get off, several are being met on the platform or by car, and the car park is busy with parked and waiting cars, and a taxi. It looks like any other perfectly normal station. 23 Responses to More than that from Ferryside? A guard on a train West of Carmarthen proudly told me on Wednesday that in the last week or so a Carmarthen guard had taken about £1000 in fares on the 08:04 too! There were only a few cars in the FGW car park at around 13:00 on Saturday 2nd, suggesting low usage of the morning services that day, but quite a number of cars had appeared by the time the boat train was due (including a taxi which seemed to be waiting to collect passenger(s) alighting from the 10:57 ex-Cardiff, and one other taxi I think). That suggests a good number of non-Irish travelers were on the daytime boat train that day. Your 6th June photograph at Goodwick seems to be showing that the 09:59 was formed of a pair of class 150 units*. This suggests to me that high demand was expected that day, any suggestions as to what factors may have encouraged that higher demand? From my (admittedly rather limited) observations, ATW seem to be quite good at predicting demand on that service. I’ve seen it empty at Carmarthen (on a Saturday) with a sizable number of passengers and a class 150 unit, and traveled on it with very few others on an occasion when a single 153 was provided. *wouldn’t that have been three units from Cardiff to Whitland, since that train has a Pembroke Dock portion doesn’t it? I was at FGW station yesterday for the mid morning train. 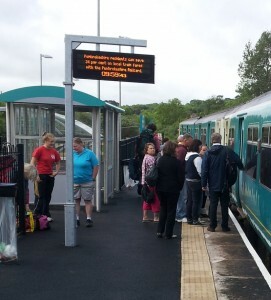 Both station and car park were busy and I counted 12 to 15 people getting on the train for Carmarthen. Later on the 19:00 train to Clarby Road, 5 people got on. 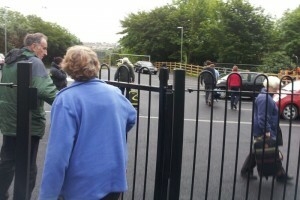 About 12 people got off the training when it arrived at FGW. So not too bad. Certainly passengers were happy and impressed with the new station. The train information system is particularly welcomed. The loud speaker is very clear and understandable unlike many other I have experienced. Good to see the “400k of taxpayers money” (as this particular guard put it) looks to be money well spent! To be fair he seemed quite a nice chap and was dealing with the flack of an hour delay on his Pembroke Dock service when I spoke to him. Intrigued as to the 8 passengers from the harbour station at 10am, what possible reason would there be for non-ferry passengers to board there now when all the parking and interchange is at F&G? DBJ, the passenger numbers in my posting were for F&G not the Harbour. I believe FGW is the code used by National Rail Enquiries for Fishguard & Goodwick station. 3 Local people accompanying departing guests for the first leg of their journey. They get off at Fishguard & Goodwick, their guests continue to Baglan, Barry and Bargoed. 5 Fun. Because it’s there. The harbour station has better facilities than Goodwick, that’s the reason I started my journey to Whitland and back (coming off the 7am bus from Cardigan) from the harbour rather than Goodwick on the station’s openning day. I can’t see that being a factor now the 7am bus from Cardigan (the one service that had a long wait for the connecting train) no longer serves the harbour though. Does the Cafe still exist at the harbour and would it be open at that time of the morning? The cafe at the harbour station is still there yes, but I’m not sure if it ever opens anymore. The station was deserted (apart from a few waiting passengers) on the few occasions when I’ve caught the 08:04. If I remember rightly, I’ve only seen staff around while waiting for the 09:56 (ignoring the boat train, it is obviously busy then), which consisted of a cleaner and somebody in the office behind the Stena ticket desk (meaning the ticket desk blinds were open) but nobody in the cafe. Yes this is one of my big bug bares in Wales we don’t provide a proper Cafe service for our visitors/Passengers coming off the train to wait then to catch the Ferry..You spend a couple of cold hours in the waiting room..What is the problem with us Welsh don’t we want to work..I can see why European workers do well over here..They are willing to work all hours to provide a service..
From the very unscientific polling method of looking out of the window, plus asking drivers, guards and signallers, there definitely seems to be a very slight increase in passengers since the opening of Fishguard & Goodwick Station. It was previously a very regular occurrence at Clarbeston Road for the morning and evening terminating services to simply wait outside the station, as they had nobody on board from Fishguard to drop off at the platform. All of them now seem to have at least one person on boar (usually more) and that’s a definite improvement. The 2nd & 3rd Upward services in the morning now seem reasonably busy, as do the two Downward services in the evening. It was very quiet for the first two weeks after the opening, but things do seem to be picking up and the Jubille weekend trains seemed very busy from the Thursday onward. Long may it continue. The café in the Harbour station still opens and seems to do so principally for the ferry arrival at 12.30 and sailing at 14.30. I think the opening hours are noon till 14.00hrs. Was there a few weeks ago to buy hot food prior to boarding the ship and there were several others passengers/workers dining there too. Spad – I suspect that the continued use of Fishguard Harbour for non-boat train traffic is partly down to the historic use of the Harbour my some travellers – if you’re getting a lift from friends or family parking charges are not an issue anyway, and it may be a case of getting on at Fishguard Harbour allows you to get use of the table seats for example. Some passengers may prefer the longer time for getting heavy luggage onto the train, or simply that they are continuing to go to the Harbour because they always have done. Some might prefer the covered over facilities provided by the Harbour. The main thing is that people now have a choice, and as predicted Goodwick does seem to be the station of choice for most passengers – as it was prior to April 1964! The added value of visibility, cheaper parking and the great publicity that the station gained from the media when it opened are all really helpful in getting more passengers on the trains. Over time people in North Pembrokeshire will increasingly realise the options of college / university education, and employment opportunities in Carmarthen are there now which will increasingly make the Fishguard / Goodwick area part of the travel to work catchment for Carmarthen – both for locals and those from elsewhere looking to live near our wonderful coast while still having good access to Carmarthen / Swansea etc. There are many commuters from places like H’West and the Pembroke line who commute to work in Carmarthen – now they can do so from the twin towns too! The 14:35 Gloucester to Fishguard dropped off 24 passengers at Goodwick on Tuesday 19th June, there were one or 2 left on for the Harbour too. Just shy of the dozen on the following 20:05 from Clarbeston Road. Car park looked reasonably full with 14 cars there too as the 14:35 arrived. The conductor’s view was that the trains are busier now that Goodwick is open too. I am looking forward to ATW getting 175002 and the other 175 from WAG2 so we can get more class 158’s to Fishguard. A problem I did notice with the suggestion of a 07:55 train from Fiushguard to Cardiff via the Swansea district line is that it clashes with the 09:11 Swansea – Cardiff swanline service between Port Talbot & Cardiff so would have to be retimed to leave Fishguard at around 07:45 and arrie into Cardiff for around 10:02. Still it woudl offer an arrival into Carmarthen for 08:37 which would be much better and attractive for commuters and those wanting to have a dayout in Cardiff. I can report that Fishguard Goodwick station was quite busy yesterday (Sat 23rd June). About 12 – 15 boarded the 09:59 to Carmarthen. About 20 got off the 18:46 arrival from Gloucester. 3 people got on the 19:03 to Clarby Road. Arriva Trains Wales website says that todays 13:30 service from Fishguard is full and has standing room only from FGW ! No point stopping at Ferryside! 13:30. That’d be the boat train, it doesn’t call at Ferryside anyway (only stops between Fishguard & Goodwick and Cardiff are Whitland, Carmarthen and Llanelli I believe*). * That’s non stop through Pembrey & Burry Port, Port Talbot and Bridgend, to name only the places which are called at by pretty much every other passenger train that passes through them. You should have seen the boat train to Fishguard Hbr today from Cardiff Central at 11:20 which was worked by a class 150 & 143616 it was heaving and passengers were standing in both units. I get your point John! Well made by the way! I’ve noticed that the day boat train has been load 4 both days this weekend. Quite a few got on at Goodwick today (Sunday) too. I took the boat train through to Cheltenham on Monday (16th Sept). Class 150 woefully inappropriate as normal, arround 11 (plus myself and my grandmother) boarded at Fishguard & Goodwick. After a circular tour, I returned on Wednesday (18th Sept) on the 16:04 from Cardiff. That also was a 150, I hope I was just unlucky and it is still supposed to be a 158. The train seemed to be reported as on time on all the station departure boards (Llanelli and Gowerton at least listed a calling point ‘Fishguard Goodwick’, the ‘&’ (or ‘and’) was missing), but was slightly late arriving so only had 1 minute to catch the 18:50 bus, which myself and grandmother just managed to do. In the rush I managed to count arround 14 other passengers alighting the train and my grandmother noted at least three bikes. Only me and grandmother left on the bus after Fishguard though, I wonder if some passengers weren’t quick enough. The 2013/14 passenger usage estimates are not all good news I’m afraid. 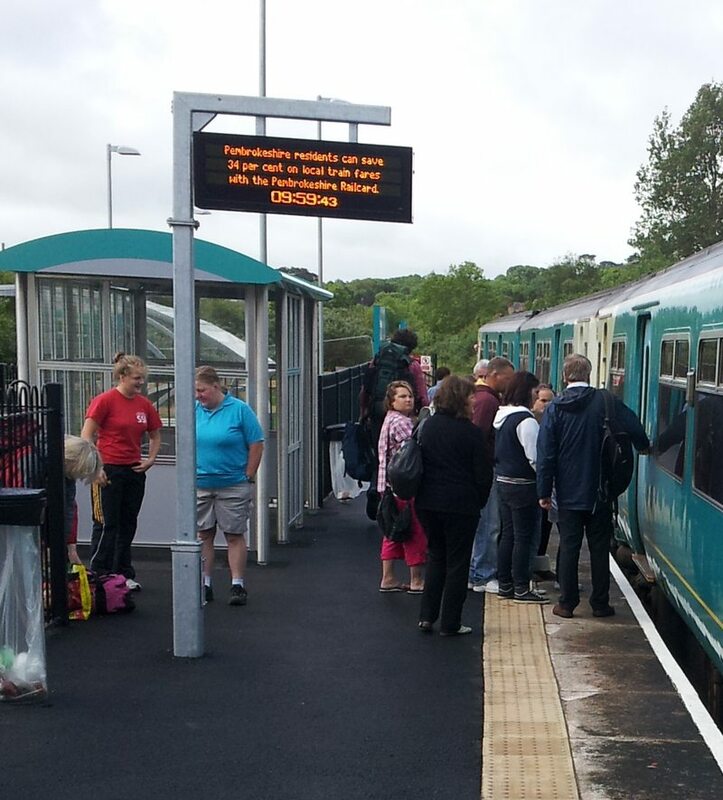 The numbers at Fishguard & Goodwick are up by 4,990 passengers, to a total of 17,062. However, Fishguard Harbour’s usage has fallen by more than that, down 6,116 to 29,404. Overall, that’s 1,126 passengers less between Fishguard’s two stations than the previous year. Perhaps the best hope is that the decline is caused by a loss of rail-sail passengers as passengers return to air travel as memories of the ash cloud incident fade, That would mean our local service is still proving its worth, but is disapointing news all the same.